After much R&D we have a bag that we believe a top pro choice bag! Not your standard dual sided slide & stick bag. 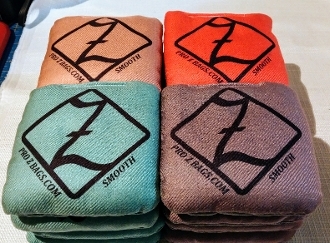 The Pro Z Smooth is a dual Slide bag. Both fabrics are moisture resistant, soft and controllable no matter the playing conditions. A poly blend twill Medium slide and a soft woven carpet feel Mild slide. They have a great pro edge feel in your hand, land soft and slide straight. This will be a great addition to any players arsenal.